Is your vehicle in need of a SMOG check? Most vehicles need to go through a biennial smog inspection to renew the registration certificate. 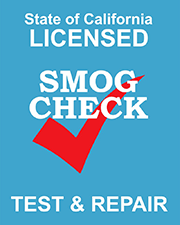 We have been certified by the California Bureau of Automotive Repair (BAR) to be a SMOG Test & Repair facility. The requirements to achieve this certification are having certified technicians and the proper equipment to complete the testing. Should a vehicle not pass, we are also authorized to explain, recommend, and perform the necessary repairs to complete the necessary SMOG Certification of your vehicle. Is your vehicle in need of a SMOG Inspection? There are some different situations that may require a SMOG inspection. If your vehicle was manufactured more than 6 years ago, and less than 1976 it will require certification every other year according to the state (some zip codes have specialty regulations, please see your state website for more details). If you are new resident to California, or are selling your vehicle, you may also be required to have a SMOG inspection completed. Contact your advisor for more details and we can help you accomplish the necessary services.